The new improved Golf Dome is better than ever! It's the perfect place to hold your next company, family or social event. Tired of the same old office or house party? We can help you plan something fun and different! 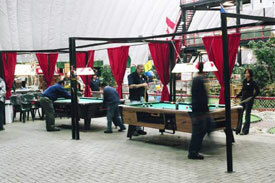 Large or small, we can accommodate your group and cater to all your needs. What kind of functions do we hold here? The list is endless! Our goal is to make sure you have fun, so call us with your ideas. We have a fully licensed bar and can provide a food menu if desired. Our facility can be sectioned off for privacy. 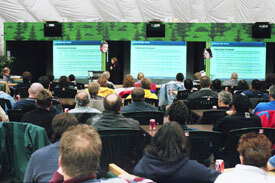 Presentations can be made on our three large screens equipped with LCD projectors. To combine fun and business, here are some popular choices. After hour sports rentals for a game of baseball, soccer, etc. Every function is unique. Contact our corporate event manager at customerservice@golfdome.ca to have a package designed to meet your specific needs.